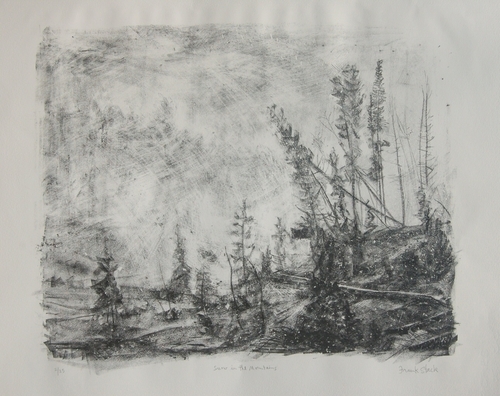 This large hand-pulled lithograph represents snow falling in the mountains in Yellowstone National Park. This image was created during the artist's visit to north-west Wyoming in the fall of 2004. By exploiting the medium, Stack skillfully captures the atmosphere of snow falling amongst the pine trees. By scratching back he creates a wild sky-scape which represents beautifully the wind-swept turbulence of the snow storm. This dramatic lithograph is one of Stack's largest and the image only shows part of the border. This impression comes from a limited edition of only 25 and is numbered "2/25". Please note: the rippled effect on the paper occurred during the production of the print and is not a flaw. Image size: 13.5" x 16.75", Sheet size: 18" x 22"